Softens & renews. Free of: sulfates, parabens, phthalates, gluten, drying alcohol and artificial colors. 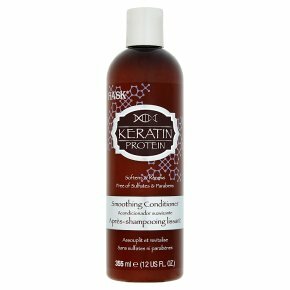 Not tested on animals.Give damaged, over-processed hair a miracle makeover with Hask Keratin Protein Smoothing Conditioner. Infused with hydrolyzed keratin to reduce fizz and block humidity, this conditioner gently smooths and detangles leaving even the most unruly hair soft and revitalized with incredible shine. Ideal for frizzy, dry or color-treated hair. Directions: Apply to wet hair. Leave on for 1-2 minutes. Rinse thoroughly. Ideal for daily use. For best results, use the Hask Keratin Protein collection.